Surreal humor and sketch comedy reign in NBC’s ad-free streaming experiment. But is that enough to justify $4 per month? Among all the streaming services that launched in 2015, SeeSo might be the most interesting. NBC bills SeeSo as a destination for “comedy super fans.” For $4 per month with no ads, the lineup includes NBC shows such as 30 Rock, Parks & Recreation, and Saturday Night Live; British comedy such as Monty Python’s Flying Circus; a grab-bag of other syndicated programming such as Saved by the Bell and The Kids in the Hall; and a whole bunch of standup. After spending some time with SeeSo’s free beta—the full service launches on January 7—I’d go a step further and say SeeSo is for a certain kind of comedy diehard, someone who favors non-obvious humor and would feel comfortable walking into a comedy club without knowing the headliner. But that’s not necessarily a bad thing. In theory, the Internet is supposed to allow niche audiences to get exactly what they want, and cutting the cord should lead to a more diverse range of content than what's been possible with cable TV. NBC is about to put that theory to the test. TV shows: 30 Rock, The Kids In The Hall, The Office (U.S. and U.K. versions), Parks & Recreation, Saved By the Bell. Originals: The Cyanide and Happiness Show, Sammy J & Randy in Ricketts Lane, The UCB Show. NBC is promising more than 20 original series in the first year. British comedy: Monty Python’s Flying Circus, The IT Crowd, The World of Alan Partridge, A Bit of Fry and Laurie, Count Arthur Strong, Fawlty Towers, Garth Merenghi’s Dark Place, Gigi: Almost American, How Not to Live Your Life, The Mighty Boosh, Snuff Box, Trollied, The Young Ones. I’ve yet to watch the vast majority of SeeSo’s content, but very little of what I have seen sits squarely in the mainstream. Outside of headlining NBC shows like 30 Rock and Parks & Recreation, SeeSo’s brand of humor is often absurd, dry, or even a bit dark. It rarely reaches for obvious belly laughs. Original programming is still a major question mark, as the beta only includes three series with one episode each. But already, I’m disappointed with The UCB Show, which is little more than a highlight reel of scenes from the famed Hollywood improv club. The magic vanishes when you’re not actually watching it live, and although SeeSo plasters original troupe members Matt Besser, Amy Poehler, Ian Roberts, and Matt Walsh across its promotional materials, their screen time is limited to a few brief (and humor-free) intro sequences. 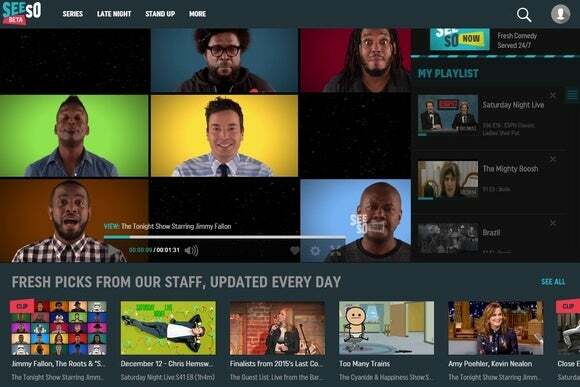 NBC has been cagey about which platforms SeeSo will support at launch; and for now, beta users are stuck with just the desktop website at SeeSo.com. Aside from requiring Adobe Flash (which is absurd for any streaming service launching in 2015), the website is fully functional, with staff-curated playlists and dedicated sections for TV, late-night, stand-up, British comedy, film, and animation. Video playback is thankfully free of any obnoxious splash screens or interstitials, and there are no ads whatsoever; clicking on a video takes you straight to the actual content. Beyond SeeSo’s existing playlists, users can mark videos with a heart symbol for later reference, or add them to a continuously running play queue. There’s even a “History” section for reviewing, "hearting," or erasing a list of things you’ve watched previously. SeeSo’s site is transparent about which shows will be leaving the service soon (older episodes of late-night shows, mostly), and which have been recently added. It’s also easy to cancel service directly through the website. 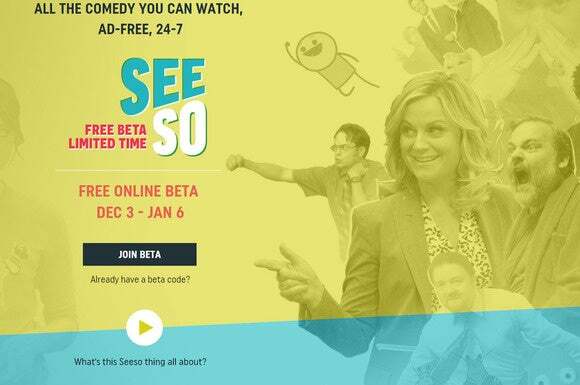 Will SeeSo be worth $4 per month when it exits beta next month? That’s tougher to say. A lot of its most recognizable material is now off the air, which means SeeSo could turn stale fast unless it constantly adds new series or nails the original programming angle. Right now, we don’t know what to expect. As I’ve written before, SeeSo is uncharted territory for NBC and TV networks as a whole, representing a new type of channel for the Internet age. I have no doubt that services like SeeSo are the future, but whether SeeSo itself succeeds is entirely up to NBC. Here’s hoping the network grants the time and investment necessary to make its experiment a hit.